Most people have fillings in their mouths and often these are the old style silver amalgam fillings. While these are very good and can last a long time we are all now far more concerned with the appearance of our teeth, and don’t want to see rows of black fillings when we smile and laugh. There is also a concern regarding the metal and mercury that these fillings contain being put in out teeth. The modern composite ( white) fillings have been developed over many years and studies have now shown that modern white fillings are just as hard and wear resistant as these old silver fillings. Studies have also shown that if teeth have big fillings then teeth restored with white fillings are less likely to crack and break. The big advantage is the appearance, they can be shaded to match your own teeth so that they look completely natural when you laugh and smile. 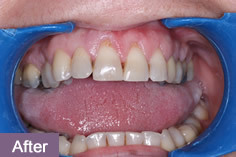 What materials are used for white and tooth coloured fillings? Composite – This is the most commonly used material as it a very aesthetic, and comes in many shades to match to your teeth. It has been developed into a very strong material and can be used in pretty much any tooth. Glass ionomer – This has different properties to composite. 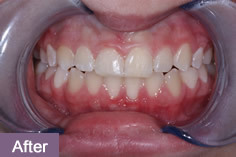 Generally it is not considered to be as good aesthetically as composite. However it contains fluoride which spreads into the tooth it is repairing. This makes it ideals for filling the roots of teeth and also children’s teeth. Porcelain – Porcelain can be an excellent choice for repairing large cavities in back teeth as it is a very hard material. It too can be easily colour matched for the best appearance. This type of filling is called an Inlay. White fillings have been placed in front teeth for decades now. There used to be question marks over whether they were strong enough to be used in back teeth. However the materials have now been developed such that even the largest of fillings on back teeth can usually be restored with composite. “Bonding” is really an American expression which refers to the use of white filling materials to correct unsightly front teeth. 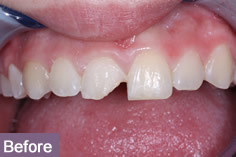 Basically the material is matched very closely to the colour of the teeth and is bonded on to them to correct minor irregularities in their appearance. Very good results can be achieved in a single visit, and often no preparation of the teeth is required. The obvious advantage is the appearance; the tooth will actually look like a natural tooth after it has been filled. Quite often is almost impossible to tell the tooth even has a filling in it. Please see our picture galleries for examples of this. Other less obvious advantages are that the material is bonded to the tooth, meaning less destructive preparation of the cavity. Also teeth with bonded fillings are less likely to form stress fractures in the future. It is also well known that white fillings do not contain mercury like silver amalgam fillings do. White fillings in the mouth look much more natural than the old grey amalgam fillings we are used to seeing, however the material is not suitable for use in every situation. 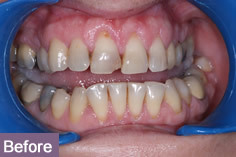 If a filling is very large, or is very close to the gum then a composite filling is not suitable. Any moisture while the material is setting damages the bond to the tooth.Very large fillings are prone to wear and fracture. We will always discuss the options with you before we choose a material to restore your tooth. Porcelain Inlays cost from £200.